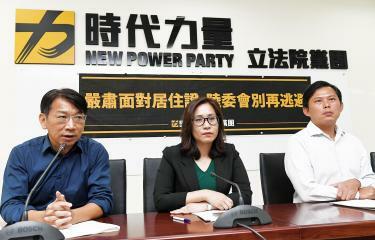 From left, New Power Party legislators Hsu Yung-ming, Kawlo Iyun Pacidal and Huang Kuo-chang hold a news conference at their party caucus office in Taipei yesterday, calling for countermeasures to China’s issuance of residency cards to Taiwanese people, along with people from Hong Kong and Macau. The New Power Party (NPP) yesterday slammed the Mainland Affairs Council for its “near incompetence” regarding China’s new measure to issue residency cards to Taiwanese and called for more concrete countermeasures from the Taiwanese government. “Although China unveiled the measure well before last week, the council did not state any plans to counter it until the party [on Tuesday] last week advocated amending the Act Governing Relations Between the People of the Taiwan Area and the Mainland Area (台灣地區與大陸地區人民關係條例) so that card holders would be treated the same as those with household registration in China by requiring them to report to the Taiwanese government,” NPP Legislator and party caucus whip Hsu Yung-ming (徐永明) told a news conference in Taipei. Although the council finally announced on Thursday last week that card holders would be required to report to the authorities, it has yet to decide whether to suspend or cancel card holders’ household registration in Taiwan, he said. A tougher approach and more concrete countermeasures from the government would not restrict the rights of Taiwanese living in China, but rather “offer them more bargaining chips when negotiating with Chinese authorities and prevent them from being pressured into applying for the card,” he added. The council’s attitude toward China has been “not only timid, but nearly incompetent,” NPP Executive Chairman Huang Kuo-chang (黃國昌) said. “Taiwanese have all been wondering what the council and the Straits Exchange Foundation have been doing. If they cannot propose any concrete countermeasures, we might as well get the Executive Yuan to put them under the Ministry of Foreign Affairs,” he said. Hsu said the party would be meeting with Mainland Affairs Council Minister Chen Ming-tong (陳明通) to get an idea of how many Taiwanese have applied for the card, whether Taiwanese have been forced to apply — and, if so, who are more likely to be pressured — and how the council plans to respond to China, adding that the party would share what it learns at the meeting with the public. While Democratic Progressive Party Legislator Wang Ding-yu (王定宇) plans to propose a draft amendment similar to the NPP bill, Hsu said he hopes that other DPP members would also support the effort. The Chinese State Council Information Office announced on Aug. 16 that from this month, Taiwanese, Hong Kongers and Macanese who have lived in China for more than six months and are legally working, living or studying in the country would be eligible to apply for a residency card. Card holders would be granted certain rights and benefits enjoyed by Chinese citizens, such as compulsory education, social insurance and housing subsidies. Firefighters head toward the quake-hit Yun Men Tsui Ti building in Hualien yesterday. Seven people were killed and 260 injured after a magnitude 6.0 earthquake struck off the coast of Hualien County on Tuesday night, the Central Emergency Operation Center said yesterday. The center’s data showed that four buildings in Hualien City had collapsed or tilted due to the earthquake: the Marshal Hotel (統帥飯店), the Yun Men Tsui Ti (雲門翠堤大樓) commercial and residential building and two apartment buildings on Guosheng 6th Street.